The sesame plant is not very demanding in terms of the climate and the soil, in which the plant grows. Despite that, the seeds are rich in calcium and valuable fats. Not many people know that Sesame Seeds are also considered as aphrodisiac. Hulled Sesame Seeds are mostly used in baking industry for bakery mixes, bread toppings and pastry such as halva and sesame seed candy. Shiv ImpEx India offers only good Quality and High Purity Sesame Seeds, thanks to cooperation with trusted Farmers’ who have proved high commitment to quality and who guarantee excellent purity and taste. Goes with chicken, salads, cookies and bread. To delight your palate even further, we propose olive bread and baked with sesame. Combines perfectly with allspice, cardamom, cinnamon, cloves, coriander, ginger, nutmeg, paprika, sumac and thyme. 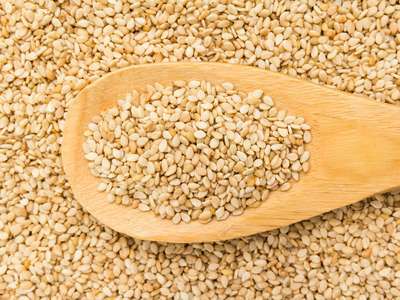 The nutty and delectable sesame seeds serve as seasoning for various dishes. Available in both black and white, the sesame seeds are also used for extracting oil. The seeds are thoroughly cleaned using water that helps in hulling without breakage.